Not me, LOL, I passed THAT milestone some time ago. It was Jarrod's yougest brother's 21 on Thursday just gone and he had a joint 21st party with one of his good friend's who will be celebrating his 21st on Tuesday. Suffice to say, this may be a bit all over the place since I'm running on around 2 hrs sleep! These are the cards I made for the boys. This is what I made for Jarrod's brother, Scott. 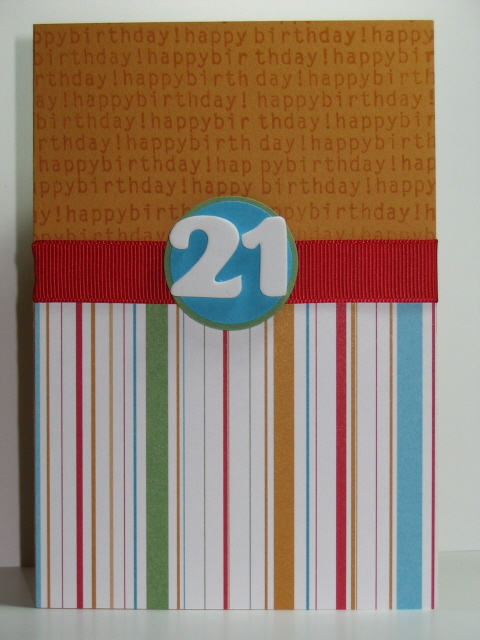 I used the Happy, Happy Birthday wheel with White Craft Ink on Craft cardstock. 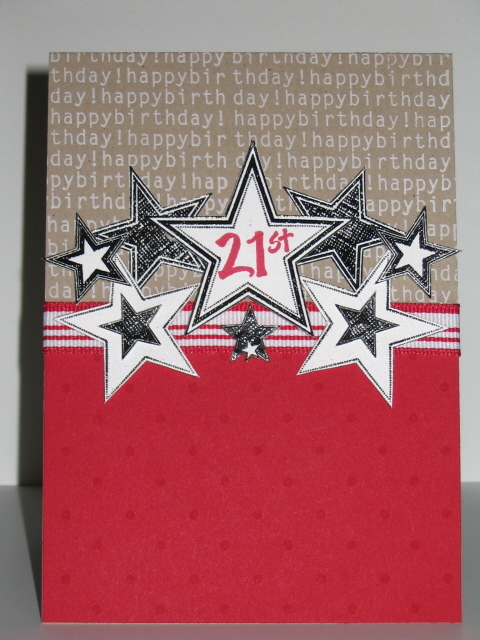 I then used the Classic Stars wheel with VersaMark on W/White textured card and embossed with black embossing powder. I wanted it to be shiny, without using glitter, after all, we're talking about a 21 year old guy. I then used Polka Dot background stamp with Real Red ink on R/Red cardstock. The ribbon is Real Red striped grosgrain and the 21st is from Image Tree by Susy Ratto (by EK Success) that I've had sitting in my stamp draw for years that has never been used. I used the stamp-a-ma-jig to align the numbers. The 21st star is mounted on 'double dimensionals'. Some of the other stars are also dimensionals. This is what I made for Scott's friend, Ryan. 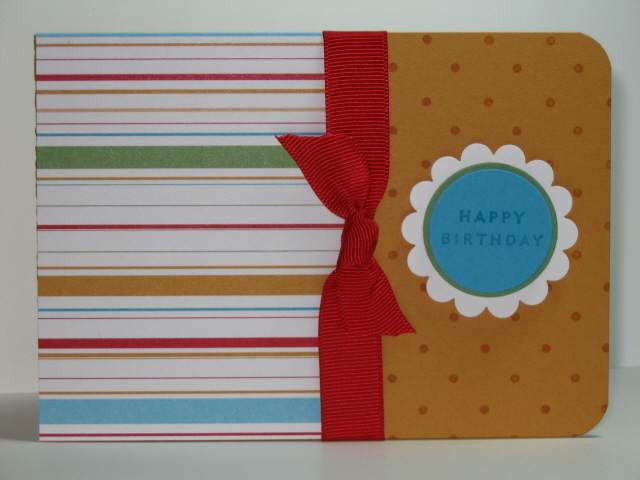 Again, I used the Happy, Happy Birthday wheel, this time in More Mustard on More Mustard cardstock. I then used some East Coast Prep DSP and Real Red 5/8" grosgrain ribbon. I then puched out 1-1/4" circle of T/Turquoise and a 1-3/8" circle of Wild Wasabi and mounted onto dimensionals. The numbers are American Craft Thickers - Giggles which are foam. This is another that I made. It actually started out as a huge mistake, I have had a lot of trouble with the Happy, Happy Birthday wheel, uneven pressure makes the words distort, a moving wheel guide gives a crooked impression etc, etc. I'm actually thinking that it may be easier to 'unmount' the wheel and use with one of the large acrylic blocks I have for my pre-SU unmounted stamps. I think I'll be abe to get a better impression first time around. I covered the dodgy wheeling with the East Coast Prep DSP and stamped the Polka Dot background on the other end. I then punched out a W/White scallop with the scallop punch and tied the ribbon in a knot. Circles as per Ryan's card and I used my stamp-a-ma-jig to separate the Happy Birthday sentiment from A Little Birthday Cheer so it would fit on the 1-1/4 circle. I think the knot in the ribbon and the scallop circle make it a 'girly' card and I really like how it turned out.